Timothy and Michelle Erskine are a husband and wife team, specializing in fine art landscapes and architecture photography. Since they met in 2003 they have shared a common drive to capture artistic and expressive compositions that reflect emotion and a unique moment in time. They approach each photo shoot strategically with research and planning to hopefully walk away with a breathtaking image. They can often be found snowmobiling into the back country or hiking up to that next amazing view point. In some cases they may need to return multiple times to capture that perfect shot. It is said that anybody can take a good picture, even an award winning photograph, however, it’s a professional photographer’s job to consistently be able to capture an intended image, typically under adverse conditions. Erskine Photography is a member of multiple local organizations including the Truckee Chamber of Commerce where they received the 2014 Ambassador of the year, Truckee Downtown Merchants Association as a board member, and the Contractors Association of Truckee Tahoe where they won the 2015 new member of the year. 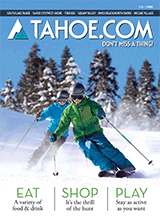 Their work can be found in many local publications including the cover of Tahoe Magazine, Tahoe Quarterly, The Weekly, Sierra Sun, Martis Camp Home Tour magazine, Truckee Chamber Visitors Guide and the TDMA walking map and brochure to name a few.